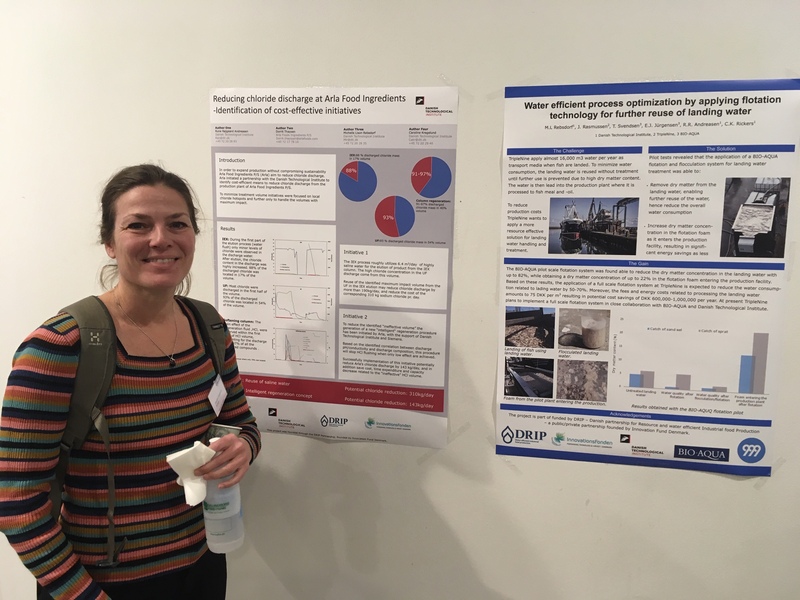 On January 31, 2019, University of Copenhagen hosted the Danish Water Forum’s annual conference; and several DRIP partners were presenting results from the DRIP collaboration. Caroline Kragelund Rickers from the Danish Technological Institute presented a poster about Water efficient process optimization by applying flotation technology for further reuse of landing water, based on a DRIP collaboration with Michelle Rebsdorf (lead) and Rune Andreasen from DTI, T. Svendsen from BIO-AQUA and Jacob Rasmussen from TripleNine. -What is the project about? TripleNine apply almost 16,000 m3 water per year as transport media when fish are landed. To minimize water consumption, the landing water is reused without treatment until further use is prevented due to high dry matter content. The water is then lead into the production plant where it is processed to fish meal and oil. To reduce production costs Triple Nine wants to apply a more ressource effective solution for landing water handling and treatment. –How far have you come? We have conducted pilot tests of a flotation system from BIO-AQUA, which has shown that we can reduce the dry matter content of the landing water with up to 82 %, enabling further reuse of the water. Hence the solution will potentially reduce the water consumption related to landing water by 50-70 %. And when dry matter concentration in the flotation foam as it enters the production facility is increased, this will result in significant energy savings for TripleNine. TripleNine plans to implement a full scale flotation system in close collaboration with BIO-AQUA and Danish Technological Institute.